The below are common errors that may occur during Flipbooks Online domain masking. This error occurs when the DNS record (CNAME) has not been created for your domain, or it points to the wrong address. Please ensure that your DNS record is pointing to cloud.3dissue.net and that it is published. You can test if your DNS record is correct by visiting the domain in your web browser. 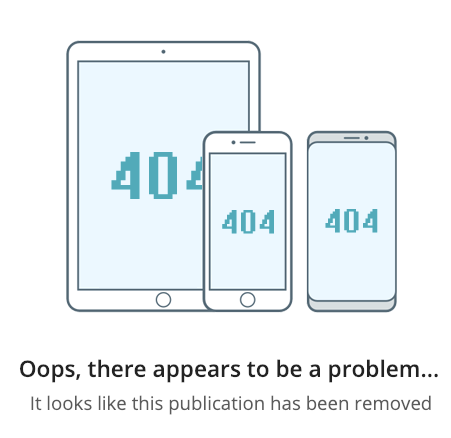 If it’s correct, it will show our default 404 page, as shown below. Alternatively you can use our masking test page to validate your CNAME. You requested the domain masking too many times in one hour. In this case, simply wait an hour and try again. If the problem persists or you have only attempted masking once then move to the next scenario. The purpose of the CAA record is to allow domain owners to declare which certificate authorities are allowed to issue a certificate for a domain. They also provide a means of indicating notification rules in case someone requests a certificate from an unauthorized certificate authority. To enable us to provide an SSL certificate, talk with your Admin or Webmaster about adding letsencrypt.org to your CAA record. This error can occur for a variety of reasons. If you receive this error please Contact our Support team who will investigate the problem for you. An internal error occurred. We have been notified and will begin investigating the issue as soon as possible. If you want more details don’t hesitate to contact us. Are there any specifications for adding graphics / images to 3D Issue? How do I add Google Analytics tracking for Flipbooks Online? Click on images to zoom them!